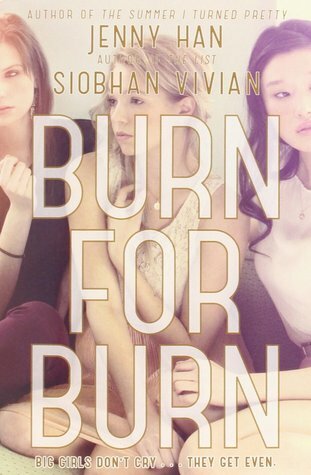 Payback is paradise in this start to a trilogy from “New York Times” bestselling author Jenny Han and Siobhan Vivian. With an alliance in place, there will be no more I wish I d said or If I could go back and do things differently… These girls will show Jar Island that revenge is a dish best enjoyed together. This book went so quickly, BUT it seemed so unnecessary to me. Just a little background here. These three girls, who barely know each other, decide to take down their enemies randomly one day when they see one another in the school bathroom. Lillia decides to take revenge on this guy named Alex who she saw her little sister with. She is best friends with him, but doesn’t actually ask him what was going on, she just assumed they were hooking up. She doesn’t get his side of the story and just decides to destroy his life…. seems…. valid? ehh not really. Kat decides to take revenge on her ex best friend (lol at that even being said) because the ex friend, Rennie, kicked her out of the friend group at the beginning of high school. AKA three years ago. Yeah, Rennie was rude, but does it mean she needs to hurt her? ehhhhhhh probably not. Finally the only (semi) valid need for revenge comes from Mary. Mary decides to take revenge on a super rude guy who bullied her to a suicide attempt. His name is Reeve. He was a backstabber who was her friend ONLY depending on the circumstance. These three stories collide that day in the bathroom where they’re all upset about something. To make this more interesting, Lillia is friends with Alex, Reeve, and Rennie. So, Lillia is attacking her entire friend group, but she’s just okay with it without much thought…. okay. The plan to get back at Alex is to make him unable to hook up with any girls ever again. Kat hooked up with him the summer before so she has some history. Anyway. So the first thing they decide to do is put something in his sunscreen that will make him SUPER sensitive to the sun. That’s just an evil move because it’s physically harming him. I had a problem with that because the girls seemed to have ABSOLUTELY NO MORALS, but you know. Teens these days. Are you serious. That line was in the fricking book. It’s just so dumb it’s almost funny. The whole book they’re getting back at Alex and he didn’t even do anything! It was all a huge misunderstanding which just makes it worse. Then the revenge for the other two takes place over the last 50ish pages. They decide to make sure Rennie doesn’t get homecoming queen, and they DRUG Reeve with ecstasy. They drug him so he’ll get kicked off the football team. wha. They buy liquid ecstasy to put in his drink at the homecoming dance. He ends up falling off a stage and being possibly paralyzed, but the girls only talk about how they don’t want to get caught! Again with the whole no morals thing. Also randomly Mary has some sort of supernatural abilities? There were quite a few triggers in this book that should be prefaced. There was talk of suicide. Extreme bullying. And an unspoken about, but slightly mentioned eating disorder. These elements weren’t elaborated enough on to make a difference in the sense of explaining or saying they’re wrong and scary, but just mentioned so you know there are some imperfect parts about the girls. I don’t think there was a lot of good in this book other than the fact that it read quickly. I finished it in a few days, and that’s the only reason I gave it 2 stars instead of 1. This characters in this book seemed too childish for it to be considered YA, but had too many difficult topics to be middle grade. This is NOT how high schoolers act, and if it is, there needs to be some serious talking about our society as a whole. I will not be continuing on with this series, but you’re welcome to give it a try lol.